Abilities: Icarus died in his original story and in the shard-influenced version. Daedalus created a mechanical body for his son and pretty much revived him using the shard which struck him down. 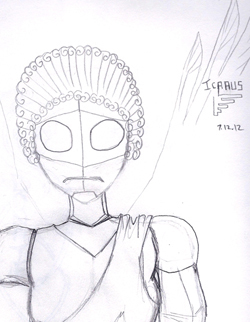 It is believed that Icarus is more resilient with a metal body than a flesh one. He probably doesn’t age, either. He is stealthy, can fly, and is probably very strong. He doesn’t appear to show much emotion and likely is not as impetuous as he was in life. Weakness(s): Icarus requires shard dust to connect his personality and mental functioning with the mechanical body. He also will do anything Daedalus says. It goes beyond devotion and questions whether Icarus truly has free will or not. Technically, the shared shard may have Icarus’s essence but it belongs to Daedalus.